Irreechaa Birraa is a celebration that repeats once in a year-in birraa and involves special activities or amusements as it has a lot of importance in our lives. It symbolizes the arrival of spring and brighten season with their vibrant green and daisy flowers.It’s a day all Oromian’s celebrate and cherish due to our ties to our root: Oromo Identity and country. It’s a time for reflection, celebration and a good connection with our best heritage, Oromummaa. This year’s Oromian Irreechaa Festival is going to be bigger and better than ever, with a whole theme park devoted to Oromian diversity where everyone’s opinions are heard and understood, and a solution is created that respects those opinions. The theme of this national Thanksgiving Day is “Moving Forward: A Year of Consensus” in which it aims to celebrate Irreechaa festivals as a medium for bringing all Oromias together to promote a process of our tradition group decision-making where the members are willing to work together to find the solution that meets the needs of Oromo people. The theme also aims to create public awareness where Oromo cultural and religious issues will be discussed, to provide a better understanding of Oromo culture and history, to pave the way for promotion of the Oromo culture, history and lifestyle and to celebrate Oromo Irreechaa, a national Thanksgiving Day. Traditionally, the Oromo practiced Irreechaa (Thanksgiving) ritual as a thanksgiving celebration twice a year (in autumn and spring) to praise Waaqa (God) for peace, health, fertility and abundance they were given with regards to the people, livestock, harvest and the entire Oromo land. Irreechaa is celebrated as a sign of reciprocating Waaqa in the form of providing praise for what they got in the past, and is also a forum of prayer for the future. In such rituals, the Oromo gather in places with symbolic meanings such as hilltops, river side and shades of big sacred trees. These physical landscapes are chosen for their representations in Oromo worldviews, for example, green is symbolized with fertility, peace, abundance and rain. Irreechaa is not only practiced among the Oromo in Oromia. As hundreds of the Oromo are in exile for different reasons, their culture, religion, language and identity also exiled with them. Because Irreechaa has a cultural ambiance in connecting the people to Oromo land and the creator, Waaqa, it still remained as strong element of connection between the Oromo in diaspora and home – Oromia. In the past ten years or so, the Oromo across different parts of the world (from Toronto to Melborne and Bergen to Johannesburg) have come together and celebrated Irreechaa as a common icon of their identity. If anything could be mentioned in bridging the differences (political and religious) within Oromo in the diaspora, Irreechaa has become the major binding force not as a mere cultural or religious practice but for its conjoint constitution of culture and identity. Currently, Irreechaa has got publicity among the non-Oromos (Ethiopians and non-Ethiopians alike) to the extent that city administrations in different countries recognized the celebration and granted the Oromo with the spaces for the ritual. 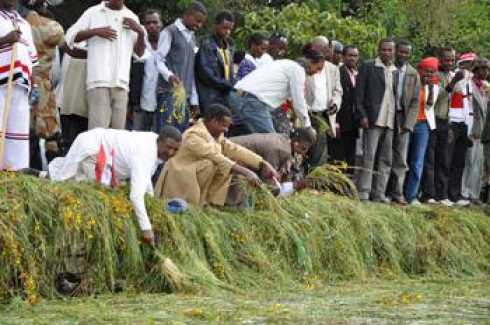 After many years’ unseen events, the first national Irreechaa Festival was held in 1991 in Oromia, East Africa and later became an annual event, which now runs for five weeks, and is one of the most pleasant reminders in Oromia that spring has definitely sprung! What a wonderful time we had on a cooler than typical spring day in 2014 enjoying all that the Irreechaa Festival presented. Here in Australia, Melbourne, we continue this fabulous event every year since 2009. For over six thousand years, the Oromo people maintained a unique national identity distinct from the national identity of Abyssinia. In 1900, the Abyssinian rulers invaded the land of Oromo people and embarked on a policy of occupation and oppression that seriously threatens the continued survival of the unique cultural and religious identity of the Oromo people. We are extremely concerned about the human rights abuses in Oromia. Tragically, a world that condemns dictators has largely ignored Abyssinia’s occupation of Oromo land. The human cost to the Oromo people has been of tragic proportions. Hundreds of thousands of Oromo’s were killed outright or died as the result of aggression, torture or starvation. Over 8,000 sacred places and centre of Gadaas were destroyed. The repression of the Oromo people in their own land continues to this day and compounds the illegitimacy of the Abyssinian rule. The Oromo people have demonstrated repeatedly against the Abyssinian occupation. Their struggle is manly nonviolent and worthy of our special attention. As Oromo, we can still overcome our multi-faces obstacles as fast as we holding our glory history and culture to ensure the survival of identity. We continue to advocate for the cause of Oromo people and for peace, tolerance, human rights, non-violence, and equality throughout the region. As our freedom fighters say, for the peace and harmony to truly turn to Oromian, our stolen natural rights must be respected. Oromo didn’t expect the loss of more than six hundred people in one day when Celebrating Irreechaa Festival in Bishoftu Oromia on 02 October 2016 before shot at by military forces on the ground while helicopters fired teargas from the air. This festival is a spectacular show of cultural, historical and natural beautification in their full glory at the height of the season. It has spawned somewhat of a science of knowing just when the blooms will peak at blooms and decline, depending on the wind, rain, and sunshine they get. Now it is the beginning of 2017 Irreechaa celebrations, the premier holiday of the Oromo people marks the end of the dark-rainy season and the beginning of a blossom harvest season. It is in Oromo tradition to gather at the river banks and lakes shores to give thanks to the almighty Waaqaa for all the blessings throughout past years and ask for Araaraa (Reconciliation), Nagaa (Peace), Walooma (Harmony) and Finnaa (Holistic Development) for the past, the present and the future. The event is very important for our community as it brings the community together and helps to connect and share experiences in their day to day life. Together, we can make our destiny better everywhere.